Despite a fair bit of commercial work I have been trying to keep up the painting expeditions. It is sometimes hard to find the impetus to go out but nearly always worth it once you do. 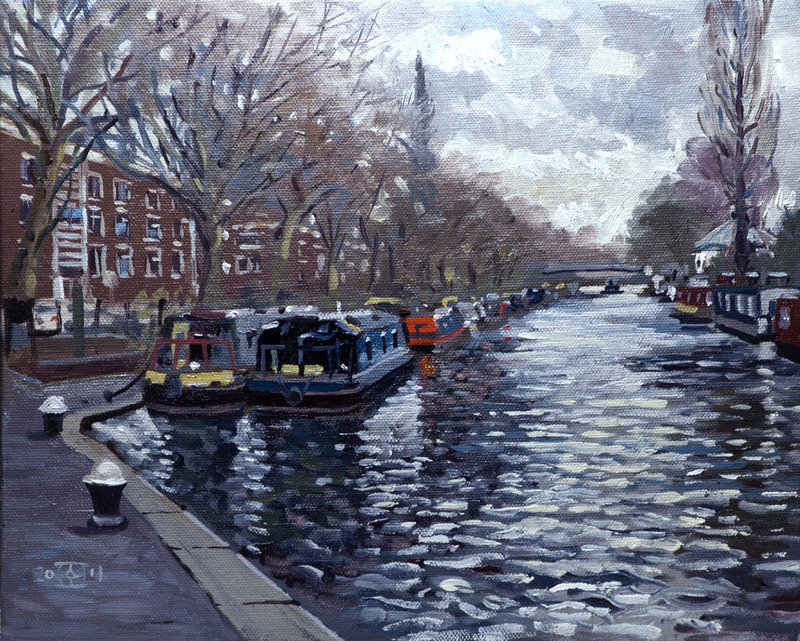 I think my next month’s task must be to do some larger pictures en plein air it can become a habit to get comfortable with a certain format, so I think I will go up a notch to 20in by 16in this of course brings with it practical issues of handling wet boards, pochade being too small etc. But not insurmountable I hope. Studio pictures is another area I must do more, I am still not happy with the balance of free handling and the consideration that needs to make up a studio work. So far I am mostly not getting the sense of “completeness” I wish to attain. It is always hard to get the balance of self criticism right, I have gone through stages where I mentally trashed every painting, finding nothing of merit in them. But this attitude is very destructive and just as bad as viewing your own work in an overly positive light. It is just as important I feel to see in your own work where you have succeeded as where you have fallen short, without some balance in your assessment of you own efforts it is hard to judge what area of your execution needs to be rethought and improved. On with some daubs, March has brought some fine subjects and some very welcome clear sunny days. Most images can be clicked for a larger view. 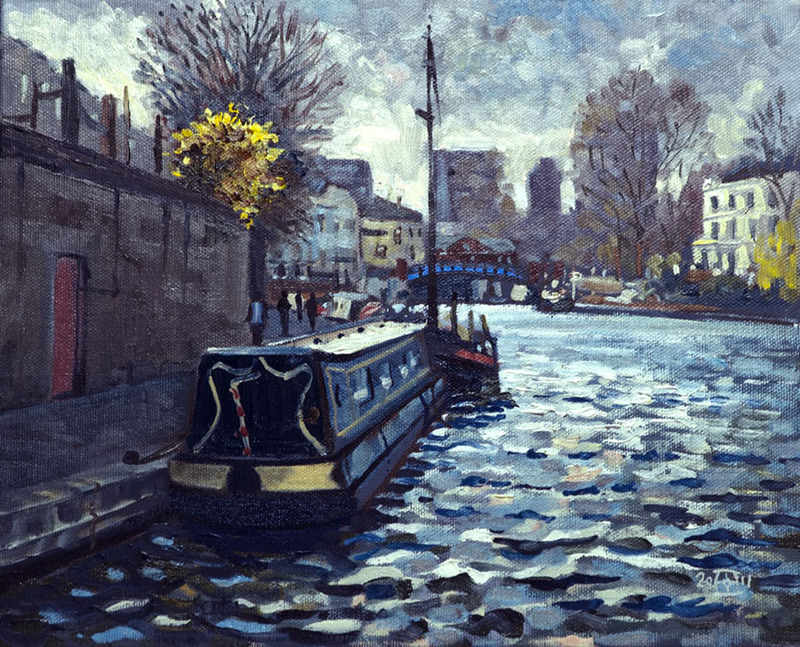 This was an expedition with the Brass Monkeys to Little Venice the wind was very brisk and cold but there were glimmers and dashes of sunlight that enlivened the scene. 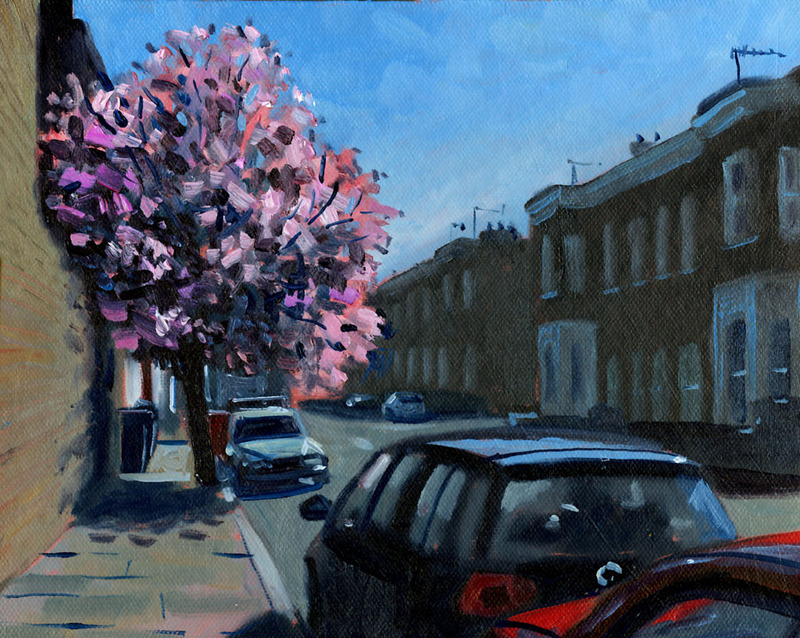 In this one the tonal balance was quite tricky I had to repaint the wall on the left twice darkening it each time. On the one hand you want to get your tones as they are in the real world, but on the other our brains make rapid on the fly adjustments to our perceptions to lighten and see into the shadows. This causes beginners to make all the shadowed areas too light reducing the contrasts and drama in the scene. 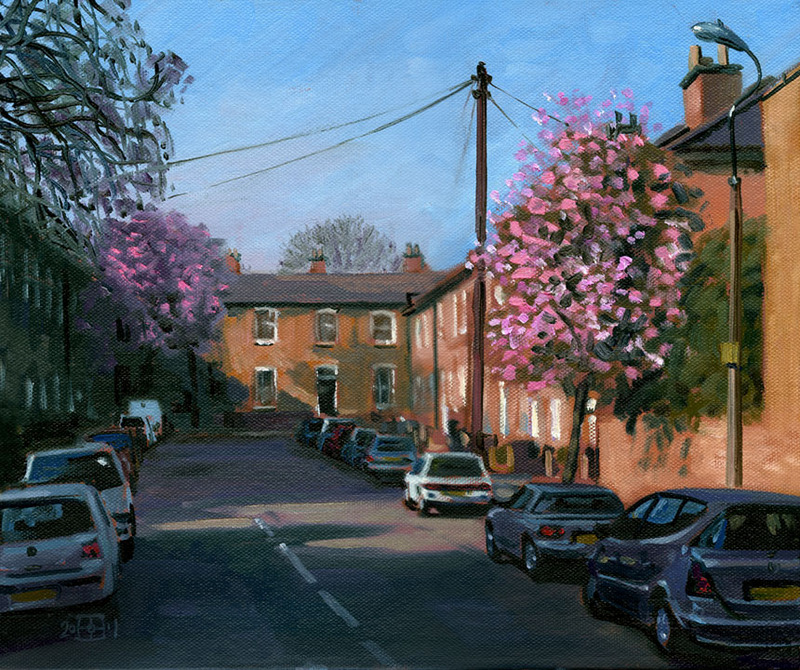 To some extent the eye will make the same adjustments when looking at a painting, seeing further into the shadows etc, but a painting is seen in a slightly different way to an actual scene so I try to bring out the shadows with colour. The other painting of the day, quite a busy subject but I couldn’t resist having a go. The restless water is a bit too dominant I feel so I might come back to this scene on a calmer day. Mind you the place I had to stand caused me to be a hazard to cyclists who rounded the blind corner behind me too quickly. It would be just my luck to cause one to end up in the drink! Spring at last! These daffodils are only yards from my front door. They were great fun to paint and I was done in under an hour. I was almost surprised when I stepped back and could see nothing more it needed… if only all paintings were as trouble free. I almost bit off more than I could chew here, the drawing seemed to take forever and the light was very flat making it hard to find a good balance of contrasts. 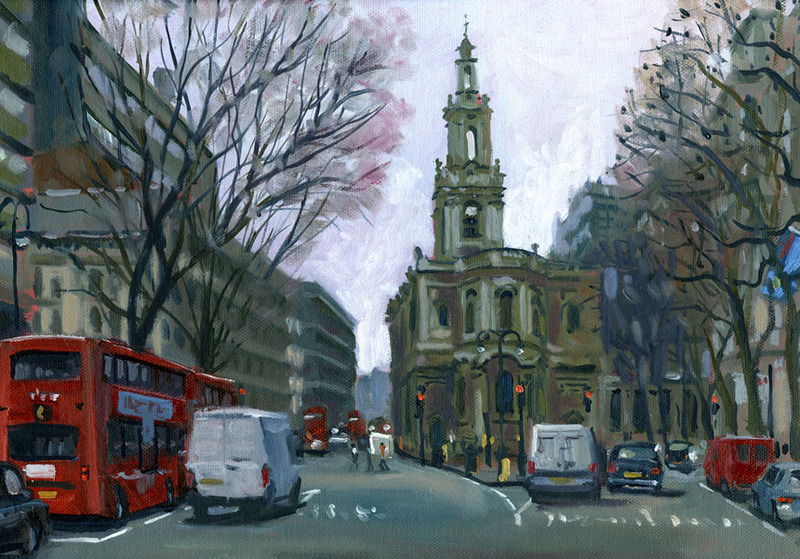 Once the traffic was done though it seemed to gain a purpose as it made an interesting contrast with St Mary le Strand marooned in the middle of the road. It may seem unlikely to us but the London Metropolitan Council in around 1905 tried hard to get it demolished as it was an inconvenience to traffic. A lovely day so I was desperate to get out having been rather mewed up at home due to various ailments. Underneath this is another picture of the bridge at Aylesford. Alas it went so wrong that I ended up scraping it off! 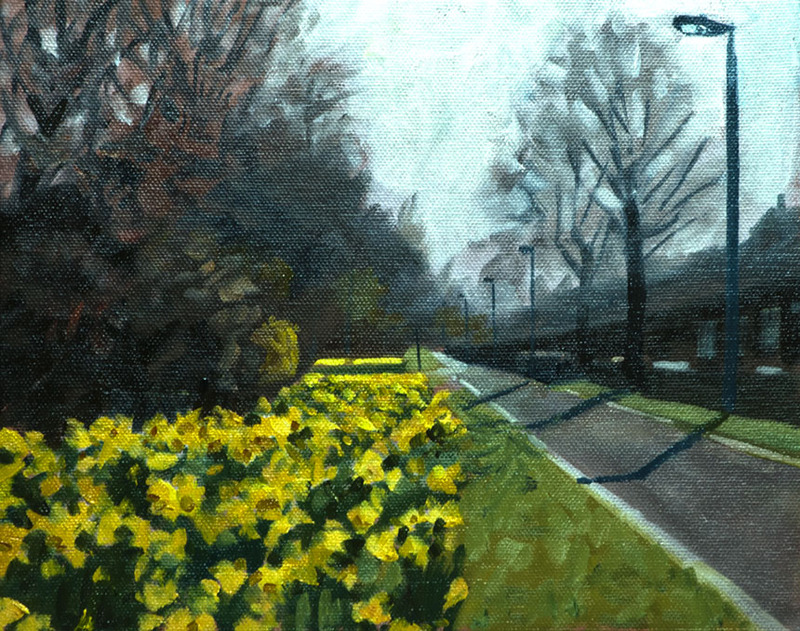 I was so eager to get painting that I ignored the fact that the light and subject were not really worth the bother of painting, I would have been better to sit and read the paper and awaited the light to improve. This scene made up for it though the light was going over rapidly and I had to rather rush it. 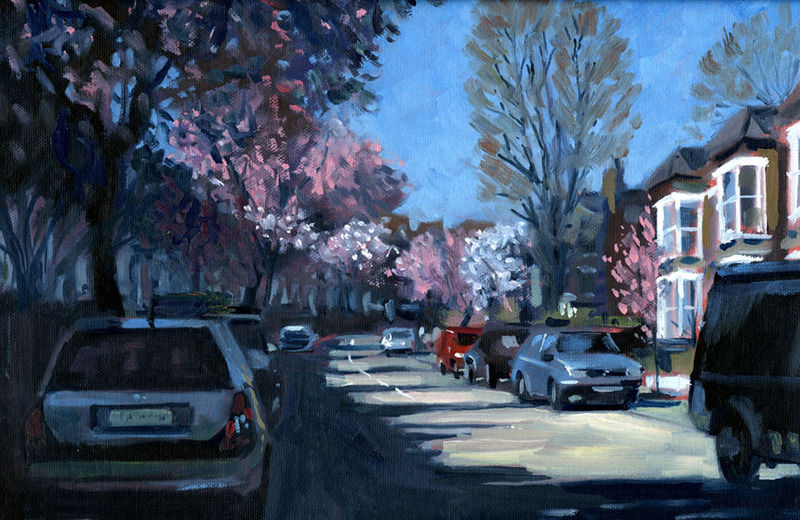 Three blossom paintings nearby to my home the brilliant spring light made fantastic contrasts. The cars become a bit of a task but I am getting better at a sort of shorthand that suggests them rather than defines too much. This way they sit into the picture better. I actually paint them in with more detail than they will eventually have then simplify them once the form is established. Lastly another outing with the Brass Monkeys. I don’t find the glass towers of Canary Wharf very inspiring but they made an interesting contrast with the old tug boat. I was lucky that a gap in the buildings lit up the funnel, though it was only like that for a short while. I might try this scene again in the studio using oils. A slightly different post. 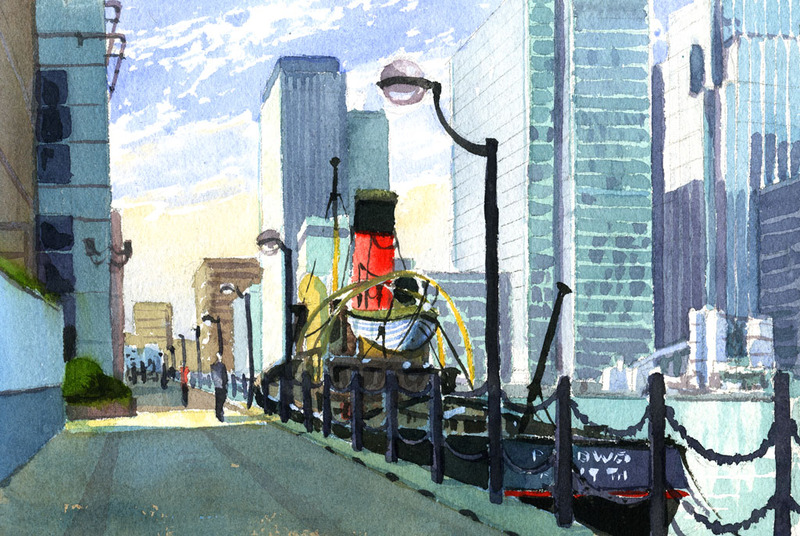 I wanted to go back over what inspires me in the work of others, in this case watercolourists. The great thing about watercolour is it’s simplicity, a pad, paints and water. No wonder it was the medium of choice when topographical subjects became all the rage in the 1800’s. Topographical subjects came to such popularity I think for two reasons, the advancement of steel engraving in printing and the wonders being reported back by the many botanists, zoologists and other travellers. 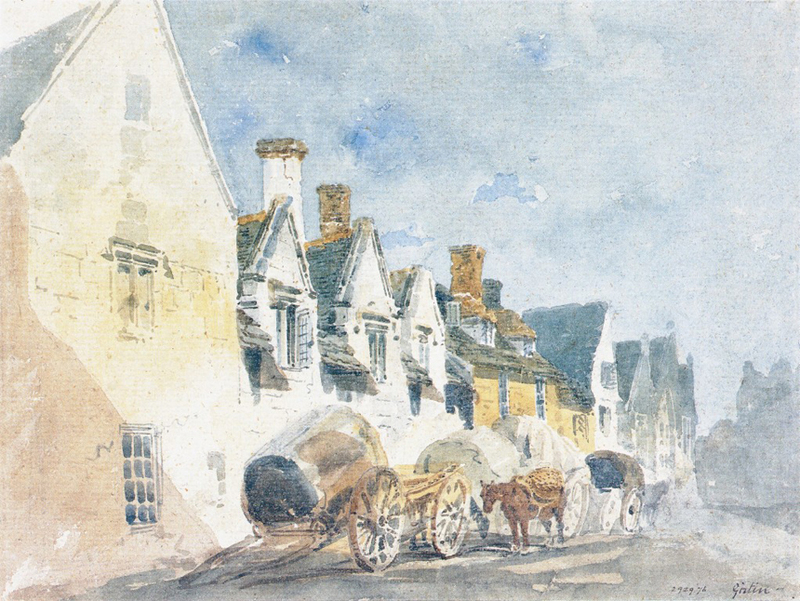 Many watercolours were painted as guides for eventual subscription series of prints. 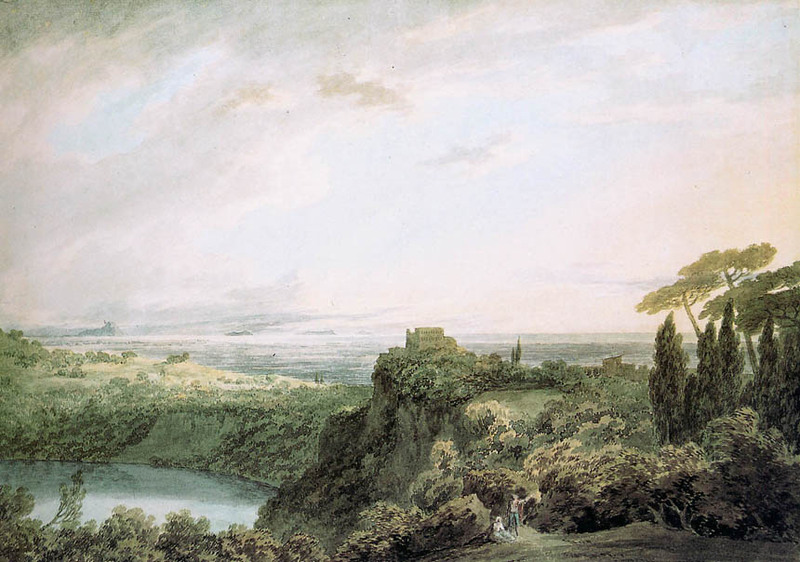 Turner was preeminent in this area producing many elaborate and imaginative paintings that became engravings. They were indeed the bulk of his output. 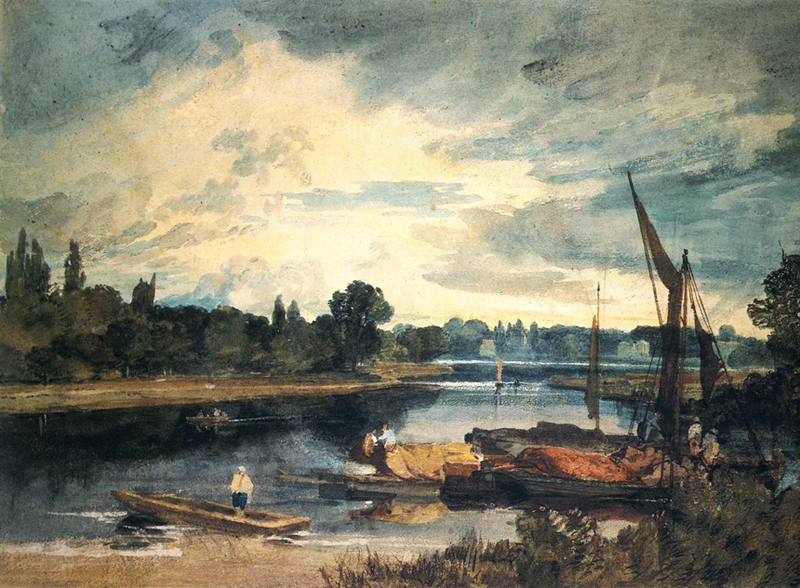 These paintings are alas not popular with curators as they don’t fit the role they have defined for Turner as the harbinger of the first stirrings of modern painting. Indeed many of the shows I have seen are dotted with abandoned first lay ins and even once the back of a sheet where he had tested his colours. I suspect Turner himself would be mortified by these choices, not that he wasn’t the master of bravura shorthand sketches, he was, but these were only notes for future reference and he would likely be a little puzzled by our taste for them. 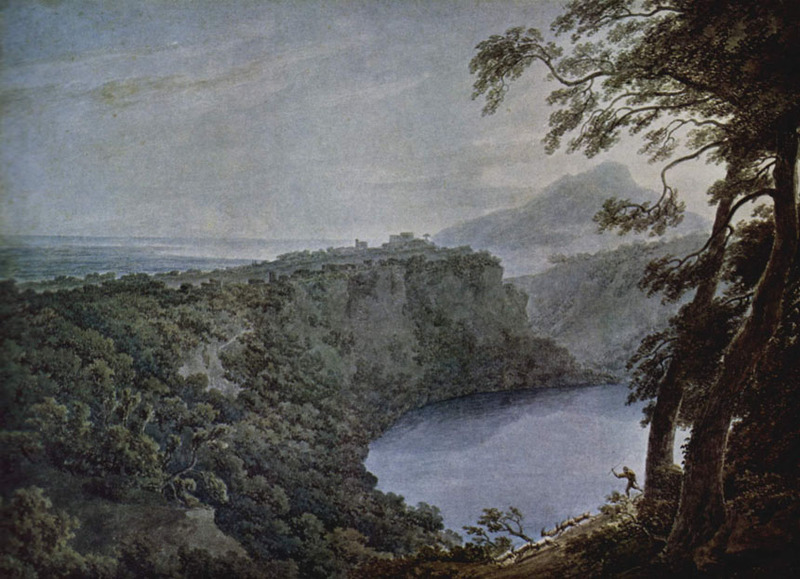 Much of the early topographical landscapes seemed to wish to redefine local scenes with the poetical eye of Claude. England was given a distinctly Italianate makeover. Not just in painting of course, Capability Brown and Repton were making a pretty good job of reshaping the actual landscape to suite the taste of the day. It was the first time when the drama of wilderness was appreciated, the well educated and heeled people going on the fashionable grand tour came back with a new idea of the sublime after crossing the Alps. 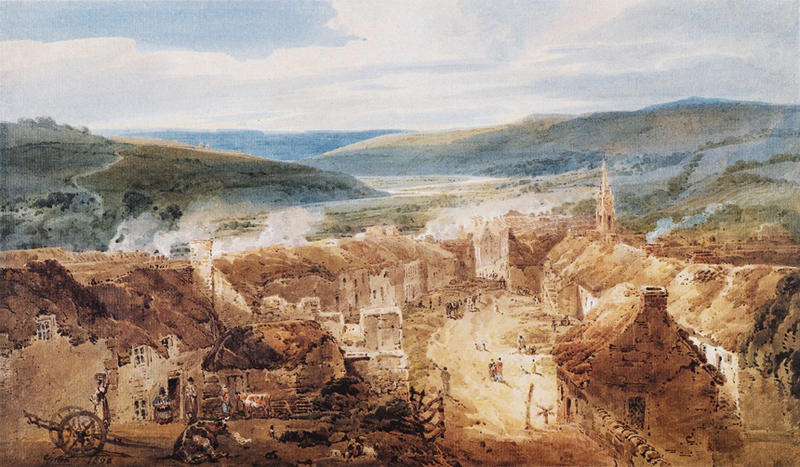 I first encountered 17C and 18C watercolours by being taken to exhibitions by my Mother who was a keen amateur herself. I remember exhibitions in the restricted light of the British Museum print room where faded works by Robert Cozens and John Varley could be seen. The first artist that really inspired me was Thomas Girtin. I still remember the picture, it was of Kirkstall Abbey with a tumbling cloudy sky above it. First some early ones by John Robert Cozens, I won’t go into biographical details, nowadays that information is a click away so I will just cover what interested me in each picture. Cozens was the earliest painter I liked. His work didn’t have that coloured drawing feeling that other painters used. Here washes are overlaid building up atmospheric depth. 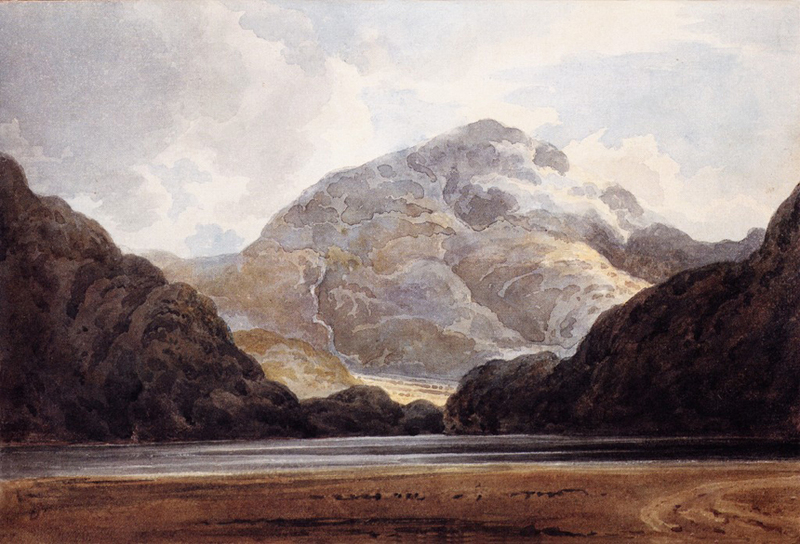 The painting was built up in simple layers, the background and distant hills and their reflection in the water, then a mid distance hill on the right running behind a middle to fore prominence with very carefully controlled strengthening of tone until it meets the strongest layer that cuts across the front right corner. You can almost imagine mounting each layer on pieces of card and setting them within a miniature theatre. Here is another but in a slightly older style with the detailed delineation of the foreground trees, but he still uses underlying washes to unify the different distances and place them in space. I suspect the colour is much faded. A final Cozens that shows his beautiful control of tone. See how the dark edge of the cliff that the castle sits upon puts it before the curve of the lake and then fades as it approaches us and drops towards the water to allow the foreground layer to sit convincingly in front. Note the little break where the figures are, which allows us a path through to the castle beyond. Here is a picture by Francis Towne, his paintings are often very stylised with each area sharply delineated but here he is in softer mood that allows us to drift off into an improbable distance. 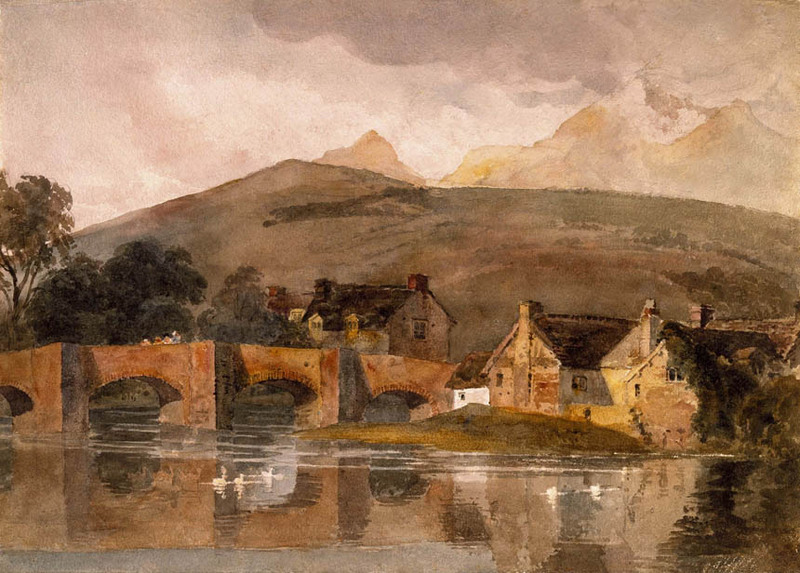 Both Towne and Cozens were collected by Dr Monroe who treated Cozens for madness this in turn led to two young men who were friends and talented painters who were employed by the good doctor to make copies of his collection. The young men in question were Thomas Girtin and a certain Joseph Mallord William Turner. Here we have the first of a few Thomas Girtins, although still in four distinct layers we now have much more integration with the road stitching fore and mid grounds together and wrapping around the focus of the Abbey. He handles detail in a wonderful way, a sort of short hand of dots and dashes that are perfectly descriptive but never quite becoming too fussy. Here is a tour de force of broad underlying washes woven together with descriptive marks and patches. Everything shaped to wrap around the focus of the village street which leads us off down the valley. Here is one of Girtin’s most famous works of the White House at Chelsea on the Thames. Such a simple but elegant painting using one of the oldest compositional tricks in the book. The white house draws our eye in then we can wander along bank or away down the river as we choose. The restful quiet of the evening is perfectly captured in the thin band of detail set between the simple areas of the sky and the water. Another Tom Girtin, Turner reckoned if Girtin hadn’t died young he would have been eclipsed by him. 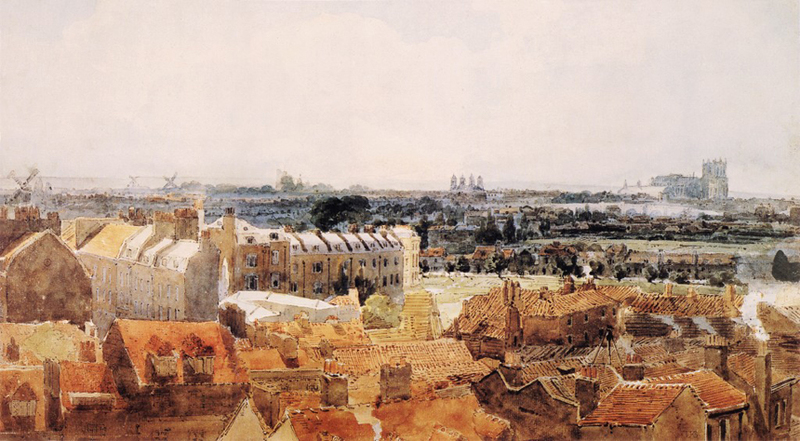 This is a working drawing for a huge diorama of London that he painted, many of the painters of the time worked in the theatre and other scenic art disciplines. Here is a Girtin sketch that looks to have been done on the spot. Much of the buildings are left as white paper with only the shadows picking out the windows and eves. 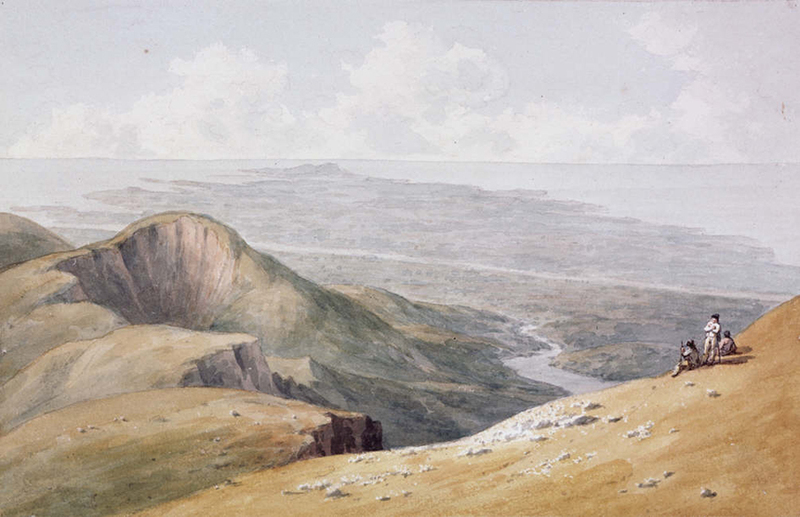 A wonderful watercolour, the complicated textures of the distant mountain are pared down to an almost abstract collection of shapes that nonetheless seem to perfectly capture the character and form. The rounded shapes of the hills are strongly contrasted by the horizontal slash of the water which perfectly sets off the dramatic but close toned distance with it’s carefully planned invasion of the mountain by the cloud. 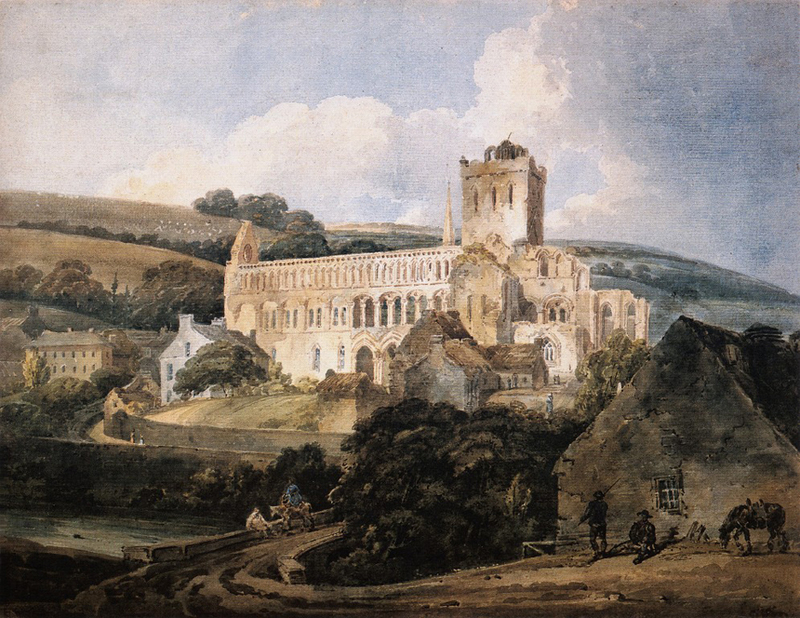 Here is Kirkstall Abbey the last of our Girtins, he plays fast and loose with the perspectives here with the foreground cottages completely divorced from the abbey. The sky is beautifully painted with wonderful control of the medium. 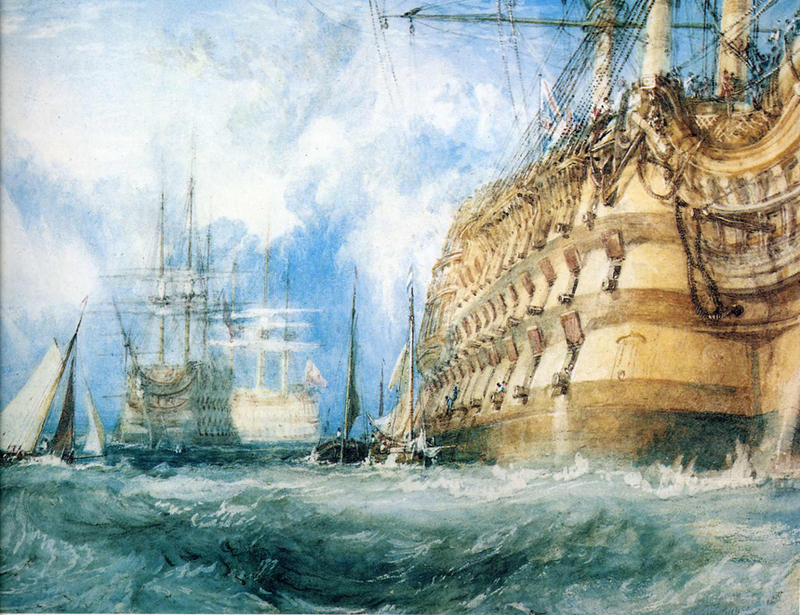 Here is a water colour by Turner, not what we usually associate with him. He habitually throws the kitchen sink any any subject he takes on, purity of the medium interests him not at all so he will use scratching out, scrubbing out and body colour at need to describe what he wishes. 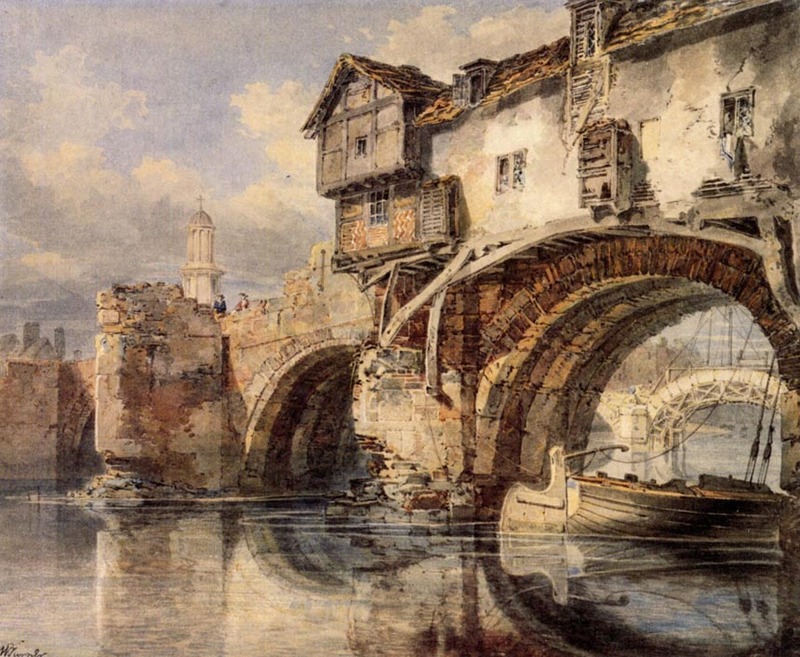 Most art historians would have us believe he became evermore inchoate and abstract as the years passed, but in reality he painted watercolours in this detailed style throughout his long life. His control of surface texture is astonishing what would seem overly busy in a lesser artist all merges into one under his expert hand. In this image he uses detail to draw our eyes to the quieter areas that stand out in comparison. The lightest light is set into the darkest dark which leads us to the flying heron. 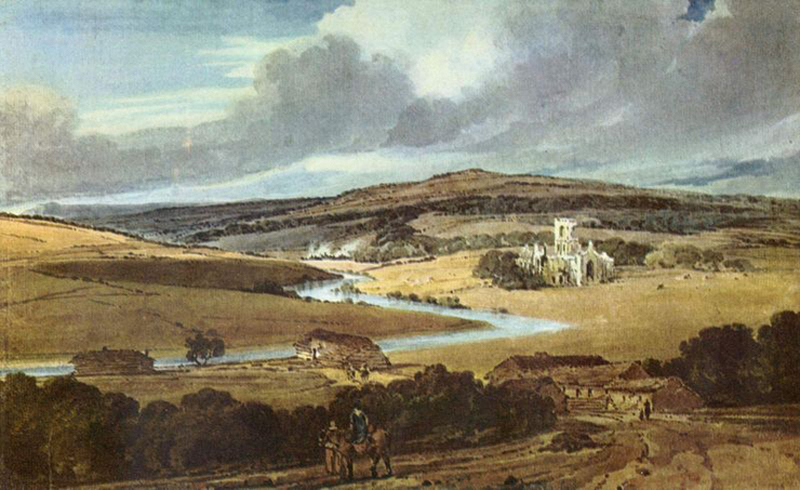 This was painted from imagination on a visit to Petworth house, he started in the morning and the final work was brought down in triumph by about 11am. The giddy perspective of the 1st Rate on the right is astonishingly well drawn. Again he uses a blizzard of drawn detail overlaying quite broad washes. 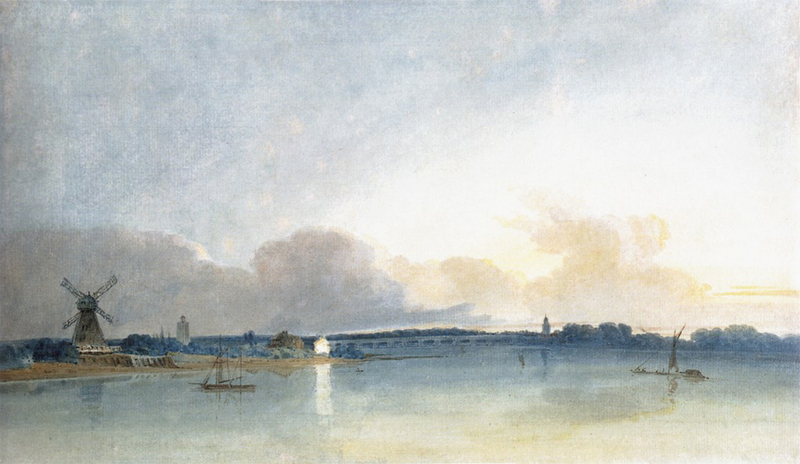 Here is an early watercolour by Turner, it is very similar in style to Tom Girtin’s, I dare say the two young men spurred each other on to make progress which might account for the similarity. 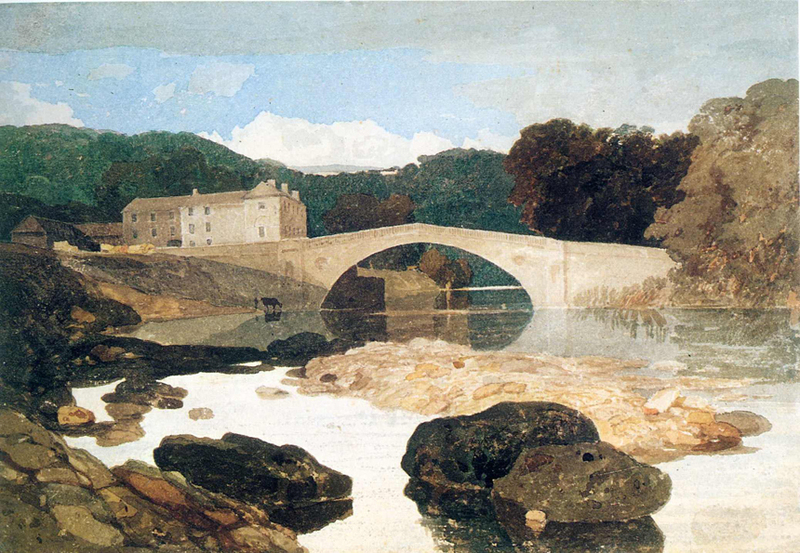 Here is a masterpiece by John Sell Cotman it has his typical crisp structure and very fine drawing. He is fond of using countershapes as in the light fence. One of my favourite watercolours. He has completely cheated the reflections of the arches, in reality they would be below the paper! 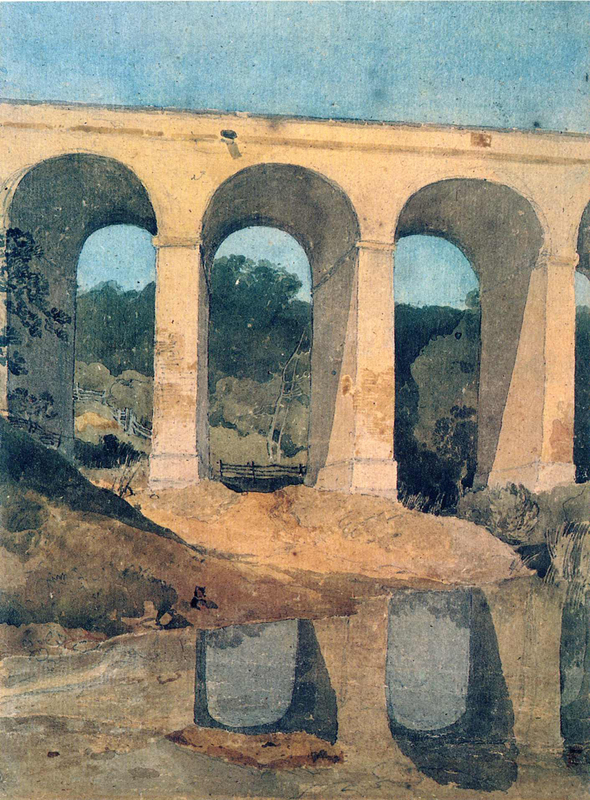 Another Cotman, here he uses the dark trees to pick out the bridge. Each area has it’s own simplified colour and tonal range, and the whole is beautifully restrained. 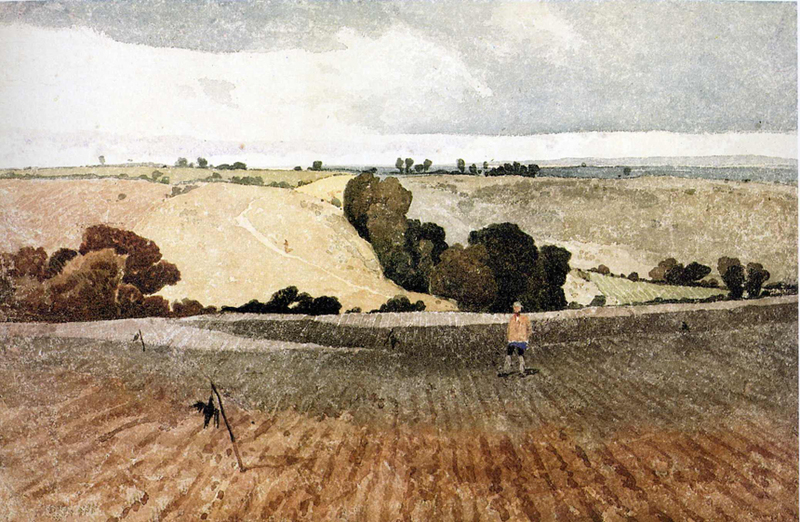 Here Cotman uses a bold composition and articulates the areas with a jigsaw of patches of paint. Old watercolours have a slightly different quality due to the higher proportion of Gum Arabic used to bind the paint. The artist would also have sized their own paper. 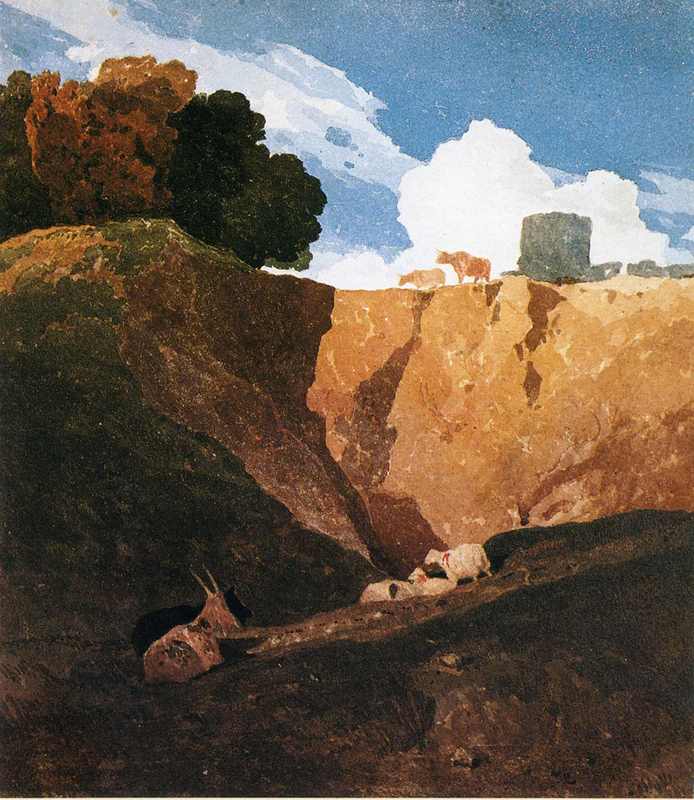 A final John Sell Cotman, beautiful arrangement of tone and colour though I do wonder how much brilliance has been lost. 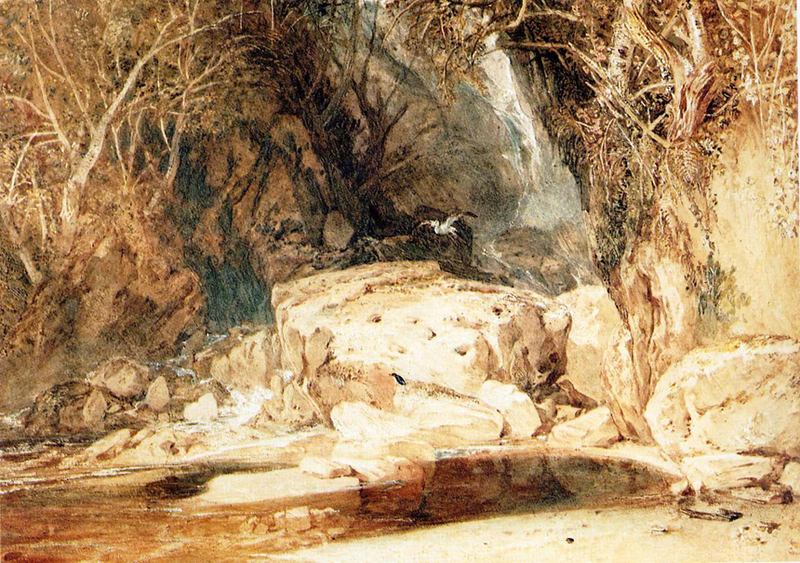 Cotman is considered by some to be the father of English watercolour, he was certainly very influential, but nowadays he might be considered too tight and not “free” enough. It doesn’t matter to me though he is one of my favourite painters in the medium. Oddly all these pictures come from his early years. In later life he became overly absorbed in architectural detail and the new technical methods of using an optical projector to do a scene in parts so that they can be assembled later into a single drawing. 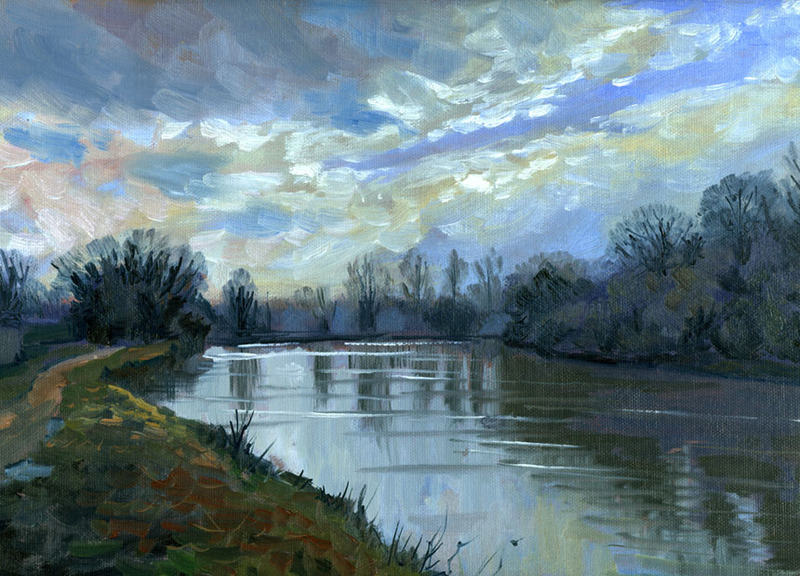 This is by Peter de Wint, he exhibits many of the techniques used by watercolourists today see how he has dragged the colour in a swift stroke on the right of the sky. The highlight on the river looks to be scratching out. Here De Wint uses beautifully controlled washes to lay in the hills and sky. The “loose” areas are contrasted with tighter defines parts in a strip across the centre with the white house providing the focus. A final De Wint this looks to be a plein air sketch it is quickly and economically laid in and displays many of the traits of “pure” water colour we admire in more modern painters.